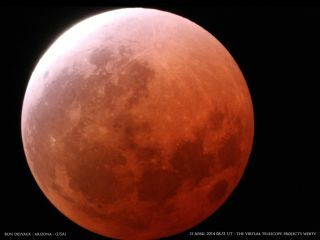 This photo of a total lunar eclipse was captured by Ron Delvaux in Arizona on April 15, 2014 and supplied by The Virtual Telescope Project. The second total lunar eclipse of 2014 will occur on Oct. 8. Skywatchers have plenty of reasons to look up toward the heavens this month. October brings a number of stargazing treats, including eclipses of the moon and sun, a dependably dazzling meteor shower, and good opportunities to view planets such as Mars, Saturn and Jupiter. A comet will also make a dramatic flyby of Mars; though that event won't brighten Earth's skies, it should find its way onto computer screens around the globe, thanks to the phalanx of probes circling and studying the Red Planent. The moon will begin entering the outer fringes of Earth's shadow at 4:15 a.m. EDT (0815 GMT), and the 59-minute-long total eclipse phase will start two hours later, at 6:25 a.m. EDT. Observers throughout the Asia-Pacific region and the western portions of North and South America will have the best views; Europe and Africa, however, will be shut out. A partial solar eclipse will follow on Oct. 23, as the moon's shadow darkens much of Earth's surface. This event also favors skywatchers in western North American; observers in Vancouver, for example, will see 66 percent of the sun's disc obscured by the moon, according to NASA eclipse expert Fred Espenak. The Oct. 23 solar eclipse begins at 3:37 p.m. EDT (1937 GMT) and ends at 7:51 p.m. (2351 GMT), Espenak wrote on NASA's 2014 eclipse page. The eclipse peaks at 5:44 p.m. EDT in Canada's Nunavut Territory, where skywatchers will see more than 80 percent of the solar disk blocked. WARNING: Never look directly at the sun during an eclipse with a telescope, binoculars or your naked eye; severe eye damage can result. Astronomers use special filters to observe the sun. This year, the Orionids peak overnight from Oct. 21-22. Stargazers under dark, clear skies can expect 20 or so meteors per hour after midnight, NASA officials said. Viewers in the Northern Hemisphere should look toward the southeast horizon, while people south of the equator should gaze northeast to catch a glimpse of these shooting stars. "Orionid meteors are known for their brightness and for their speed. These meteors are fast — they travel at about 148,000 mph (66 km/s) into the Earth's atmosphere," researchers wrote on NASA's Orionids page. "Fast meteors can leave glowing 'trains' (incandescent bits of debris in the wake of the meteor), which last for several seconds to minutes," they added. "Fast meteors can also sometimes become fireballs: Look for prolonged explosions of light when viewing the Orionid meteor shower." Skywatchers can also get good looks this month at several different planets. In early October, for example, Mars and Saturn are visible low in the southwestern sky in the evening. Jupiter, meanwhile, is king of the predawn hours throughout the month. A comet will make a dramatic planetary flyby this month, as well, but of Mars rather than Earth. Comet Siding Spring will come within just 83,000 miles (132,000 kilometers) of the Red Planet on Oct. 19; for comparison, the moon orbits Earth at an average distance of 238,900 miles (384,400 km). Comet Siding Spring won't put on a show for viewers here on Earth. But the fleet of robots at Mars, which includes five operational orbiters and two working rovers, could send some nice pictures of the encounter back home. For instance, NASA's Mars Atmosphere and Volatile Evolution probe (MAVEN), which arrived in orbit around Mars on Sept. 21, will take a break from instrument commissioning activities to observe the comet flyby, taking special note of any effects on the Red Planet's thin atmosphere, mission scientists have said. Editor's Note: If you snap an amazing image of any celestial sight, you can send photos, comments, and your name and location to managing editor Tariq Malik at spacephotos@space.com.